Maia is the first of the three Werdes, the spinner of the thread of life, the creatrix of the world-illusion. Because of this, there is a certain ambiguity surrounding Sai Maia. In some Hindu thought, Maya is seen as something essentially negative: a synonym for the illusion of material existence and the ignorance (avidya) that makes it possible. In Greek myth, Maia is viewed much more positively as the goddess of Spring and the coming of new life. Of course these two views are the positive and negative aspects of the same Reality. 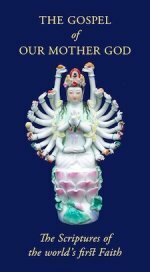 While Maya is associated with avidya, non-wisdom, the Greek goddess Maia is the mother of Hermes, the god of wisdom, and in Buddhism, Maya is the mother of the Buddha, the incarnation of wisdom. Budha/Buddha, like Hermes, is the planet Mercury (the name is etymologically identical [b for w/v] with Woden/Wotan the Germanic name for Hermes/Mercury). What does all this mean in terms of the Mother-Faith? And of both worldly enjoyment and liberation. "Intelligence", here is used in precisely the Hermetic, Vedantic or Buddhistic sense, of transcendent vision that sees beyond the world illusion, but unlike dualistic patriarchal doctrines, the faith of our Mother God unites this with the enjoyment of Maia's bounty. The importance of this verse is its indication of the balance between worldly and spiritual goods offered by Mahalakshmi. Worldly people pursue only the things of this world. Spiritual ascetics preach a complete abstinence from the world. Worshipping our bounteous Lady, we may combine the two – innocent worldly pleasure and spiritual advancement. Sri Mahalakshmi is both Mahamaya—the creatrix of all material and non-material manifestation—and Sripitha, the sacred abode, the dwelling at the very heart of being, the Realm of God that is “within you”. Thus Sri Mahalakshmi, as the manifestation of Dea Herself, represents both the infinitely great and extended, and the infinitely small and central. Thus, like all Janyati, or Great Angels, Sai Maia, while seen (and correctly seen) as a separate entity (or as some would say, "goddess"), is ultimately a stream whose Source and true Identity is Dea Herself. This is the thealogical background to Maia's Day, one of the minor festivals of the Déanic/Filianic year. In practice the festival is a celebration of Spring, coming exactly a month after the Filianic New Year and ushering in the month of Maia (very roughly corresponding to May, which of course was also named for the Goddess Maia and in the Catholic church is dedicated as Mary's month). It is a time for bringing spring flowers as gifts to Our Lady's altar, a ritual enactment of the acceptance and sanctification of the beauty and bounty of "worldly enjoyment". Only so far as You are acting through me." and of the sacred chant Marya, O Marya, enter my heart as Thy love. The love we give to Our Mother is always the love She gives to us: for She is the Source of all love. 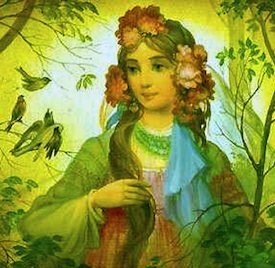 The Day of Maia is a celebration of Spring, of Creation and of the beauty of nature. It is the adoration of the Mother as Creatrix of all things and of Sai Maia who spins the thread of this worldly life. For while worldly existence may be an illusion and a snare for those who regard it in a purely material way, for those who worship Our Mother God, Sai Maia is always the Mother of Wisdom. Each of the three Werdes, Maia, Werde and Kala, has her own month. 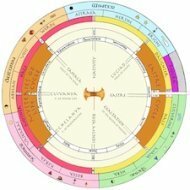 The month of Maia is the second month of Spring; the month of Werde is the last month of Autumn, and the month of Moura is also known as Kala. It is the month of the "cutting" of the year, ruled by the Dark Werde. Curiously, the Day of Werde does not fall in the month of Werde, but in the month of Vaskaras, the last month of Summer. This is said to be because the Day of Werde celebrates the full Werde trinity and not only Sai Werde herself.